We left what we called Pika Hill camp this morning. We so enjoyed sitting by the big rock pile and watching the pikas scurry around after dinner last night. We are easily entertained out here! This pika was clearly the sentinel for the pika colony. He watched out for the others and squealed loudly whenever Ray or I moved closer. Today we have a short day of 12 to 13 miles but need to get a ride down the Forest Service 503 road into the town of Creede. It is eight additional miles downhill if we walk it but supposedly there are enough people that drive up the road to either go to the Equity Mine or hike up San Luis Peak, a fourteener, from the Trailhead at West Willow Creek. It is a gorgeous morning and we are in the La Garita Wilderness which is a beautiful area. We hike up the Cochetopa Creek drainage and over San Luis Pass which provides access to San Luis Peak, one of the easier fourteeners to hike in Colorado. We climbed San Luis Peak 25 years ago and it is a foggy memory but a little familiar as we get to the Pass. At the Pass, we meet several trail buddies, Calvin, Brendon and Greg that we had met back at Tank Seven Creek on day 22. 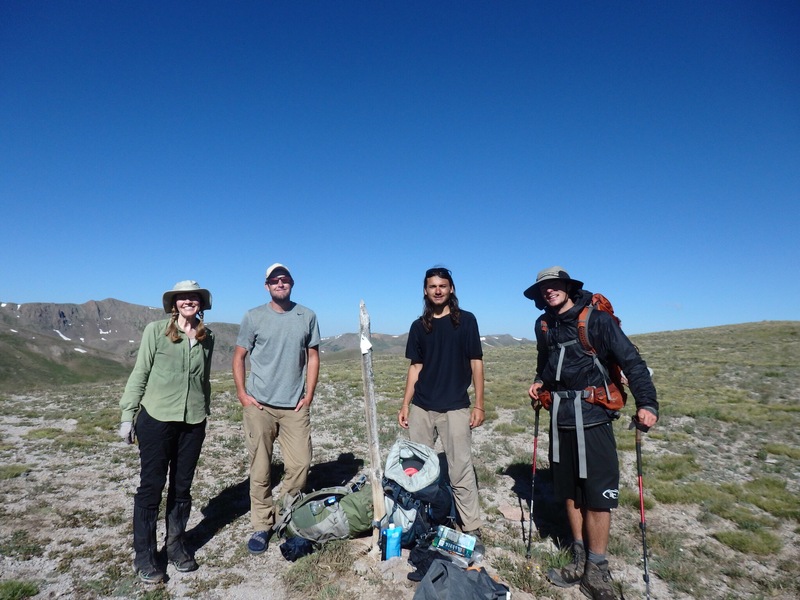 Me with trail buddies Calvin from Dolores, CO, Brendon from California, and Greg from Colorado Springs on San Luis Pass. Only one of us is, ahem, over 25……. We have a good time talking about getting to town and what we are going to eat or drink. Life gets very basic when you are thru hiking! They had hiked up to the top of San Luis Peak for the sunrise. It is such a glorious day and nice to have some sunshine. Pinnacles of Lahar deposits. Lahars are mudflows or debris flows from volcanoes that flow like wet concrete. Once we get to the dirt road at the Equity Mine that is about eight miles from Creede we realize we might have underestimated how many vehicles and potential rides there are to Creede. There are four vehicles parked at the Trailhead and the mine is closed and not currently active. Luckily about 5 minutes later, a couple, Conner and Heather from Austin Texas, show up and agree to drive us to town. Phew! We got a ride from one of the four vehicles. Day 27 is a zero, or rest day. It is amazing how things we take for granted like a bed, shower and food become sensory highs when you haven’t had the convenience for a while.